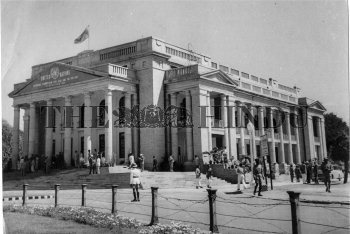 Caption : The ECAFE Committee on Trade and Industry and Commerce opened its session at Bangalore, the capital of the southern Indian State of Karnataka on January 24, 1956. The Chief Minister of Mysore, Mr. K. Hanumanthiah, inaugurated the session. Picture shows the Sir Puttanna Chetty Town Hall, where the session was held.